Although my love for restaurants that serve good food -- real food, whole food, food grown locally and raised ethically -- is well documented on this site, I've tended to be less effusive in my praise of ethnic restaurants. The reason for this is simple: finding an ethnic restaurant that sources local food can be a challenge. There are, of course, exceptions: Sen Yai Sen Lek in North Minneapolis is one of my favorite Thai restaurants of all time, serving up amazing dishes filled with fresh, seasonal, locally raised meats and vegetables. Ngon Bistro is another great find, serving a sort of Vietnamese fusion-style local food in St. Paul. Rainbow Chinese, ChinDian Cafe (both in Minneapolis), and Tanpopo Noodle Shop (St. Paul) serve local foods too. I celebrate these restaurants' commitment to serving good food in a market that doesn't necessarily understand the difference between a conventional chicken satay that costs $5.95 and a local one that costs $8.95. And I am very, very grateful to have them. All of which brings me to one of my favorite new restaurants, Gorkha Palace, specializing in locally sourced Nepali, Indian, and Tibetan foods. 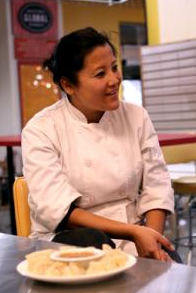 Gorkha Palace is the creation of Rashmi Bhattachan, affectionately known to Mill City Farmers Market regulars as "the momo lady." Rashmi, who has been serving up momos -- delicious dumplings seasoned with traditional Himalayan spices (cumin, coriander, garlic, and ginger) and served with a tomato based chutney (we first wrote about them here) -- for nearly three years, has teamed up with chef Sarala Kattel to create a traditional menu that features loads of local foods. "I practically grew up in a hotel environment," Rashmi tells me. "My family owned a nice medium-sized hotel in Nepal. It was my passion for cooking and my dream of being an entrepreneur that led me to the Mill City Farmers Market." It was Rashmi's customers who got her thinking about opening her own restaurant. 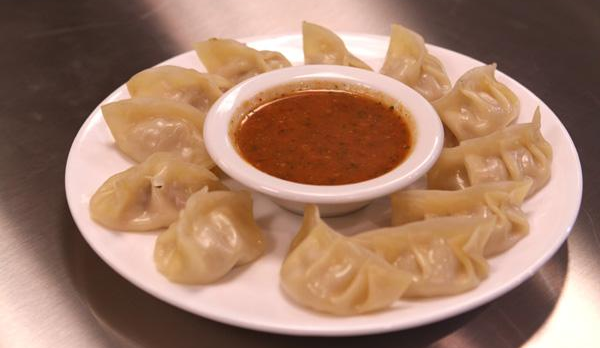 "They kept asking me, 'where can I find momos during the week? Do you have a restaurant?'" Photo of Rashmi Bhattachan (and momos above) by Katie CannonI've known Rashmi for nearly a year, during which she has meticulously planned all aspects of the restaurant, asking for advice from friends and cohorts regarding location, partners, and suppliers. "After months of searching and planning," Rashmi says, "my restaurant incorporates my values and philosophy: we use fresh ingredients, we support local farmers and suppliers, and we've implemented sustainable practices like recycling, composting, and using 100% compostable to-go containers." Rashmi proudly tells me that she owns "the first Nepali Indian restaurant to go green." As Rashmi went through her list of vendors, I found myself surprised and delighted by how much local food could be used to create traditional Nepalese food. Many of the ingredients, such as beef from Thousand Hills Cattle Company, chicken from Kadejan, eggs from Larry Schultz Organic Farm, even yak from Hooper's Yak Ranch (! ), can be sourced locally year-round, right here in Minnesota. How's the food? Really, really good. For dinner, my wife and I shared a variety of momos, all fresher and tastier than the ones we loved at Mill City. We also shared naan bread, mitho kurilo (a spicy asparagus and potato dish), and the best chicken tikka masala we've had in the city -- all white meat, cooked in organic cream from Organic Valley. Everything was delicious, flavorful, and cooked fresh (it is definitely not fast food, in any sense) -- and spicy. We returned a week later for the lunch buffet, stuffing ourselves with delicious (and much less spicy) selections like curry chicken, vegetable pakoras, chicken chhoyla (grilled with peppers and lemon juice), and a variety of chutneys. We're looking forward to our next visit already. Lee Zukor is the founder of Simple, Good, and Tasty. E-mail him at lee@simplegoodandtasty.com or follow him on Twitter.